Our core activities are organized to accelerate and enlarge the genetic engine of a breeding program. 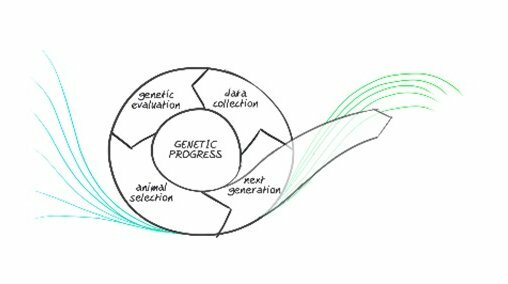 Everything we do revolves around gaining genetic progress with the animals we breed and the traits we select. How does it work? 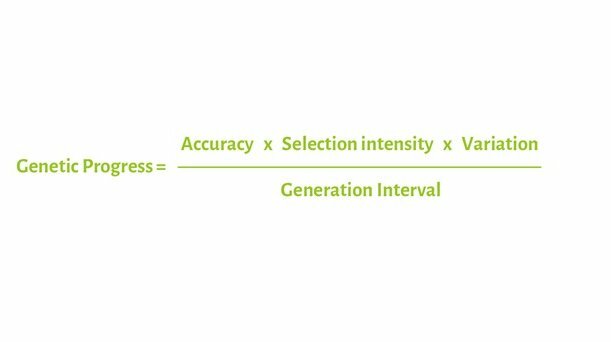 Genetic progress is achieved via accuracy in selection of the animals that will reproduce. That requires the collection, processing and management of the right performance data of individual breeding animals and their pedigree. Animal selection is based on large gene pools to increase the selection intensity with sufficient genetic variation. Without variation there are no animals that outperform others, so nothing to select upon. Without sufficient numbers of animals, one cannot select the best of the best. In simple terms we look to have the greatest number of animals, select for those showing the best traits and repeat that multiple times with the shortest amount of time possible between generations. This enables us to rapidly improve genetic progress in our different species. We will explain genetic progress in an easier way. The process can be visualized with an illustration. We collect data of a generation. We evaluate their genetic potential. A selection is made based on this information and the next generation is produced. It is a continious improvement cycle. We will explain our genetic engine in more detail in our upcoming articles. With animal science constantly developing new technologies and new tools we simply gain more possibilities to make the genetic engine run smoother and faster.